BAGJUMP® Custom Developments - Let us turn your concept to reality! Our company was founded on the idea that things are never impossible – they just haven’t been done yet. We have become the go-to address for concepts and prototyping involving any form of horizontal/vertical impact by a person or object. 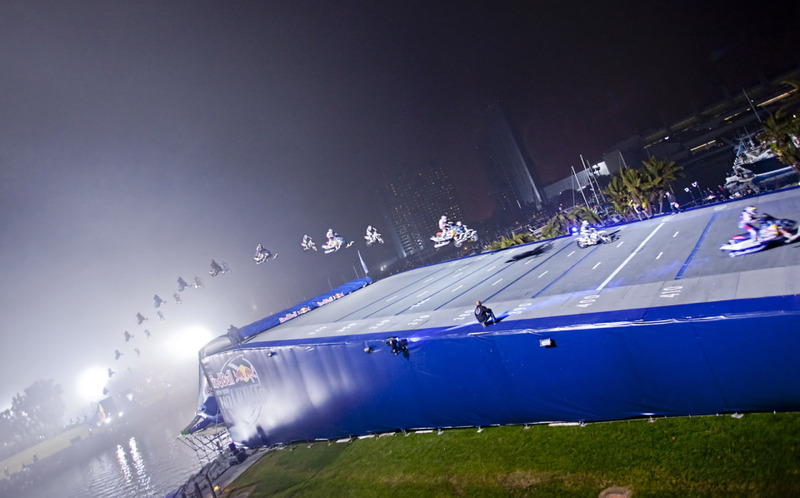 Over the years, we have worked with the elite in motorized & non-motorized sports, the Hollywood film and stunt industry, aerospace & tech companies and more. Safety and a timely project completion are extremely important to us. Our team of in-house engineers, construction, and material experts enables us to go from sketch to finished product very quickly and efficiently. We have acquired very specific knowledge and the skills needed for developing, prototyping and finishing custom airbag solutions to exceed your expectations. 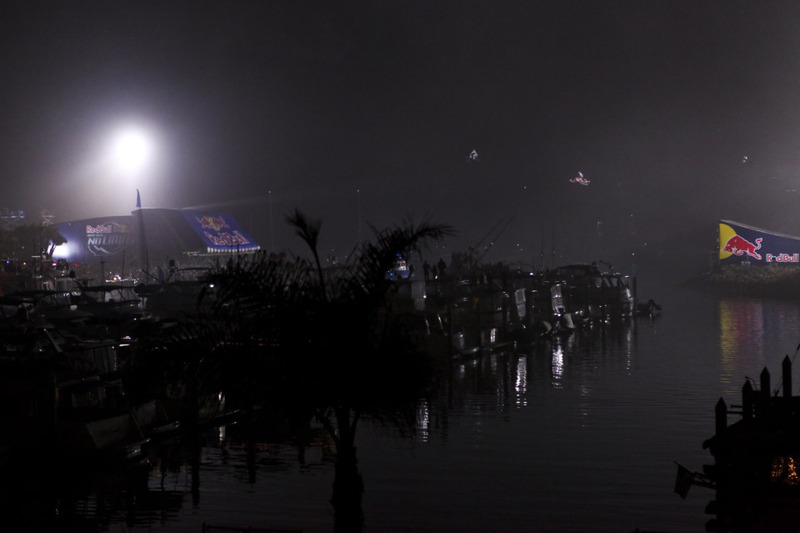 Many of our most interesting custom projects are confidential and can not be published here. This is especially the case for aerospace, the stunt industry and tech projects. So take a look here at a few of the projects we are able to show you. In late 2016, Jaguar approached us with an interesting idea. For the launch of the new Jaguar E-Pace they wanted to recreate the iconic barrel roll from the James Bond movie ‘The Man with the Golden Gun’. Only this time, it would not be a specially prepped stunt car, but a regular road car F-Pace with the only modification being a roll cage and some suspension modifications for driver safety. As only 2 cars were available (one for tests and one for the stunt) it meant that we had exactly one car with zero tolerance for damages. The challenge was to safely stop a 1.7 ton SUV at a vertical speed of approx. 90km/h with an unknown landing orientation. After several meetings with the project team at Jaguar we built this highly customized airbag system with the toughest materials available to prevent any damages. It took over 100 jumps to fine tune the weight distribution, ramp design, suspension settings and speed in order to get the rotation consistent enough for the main event. 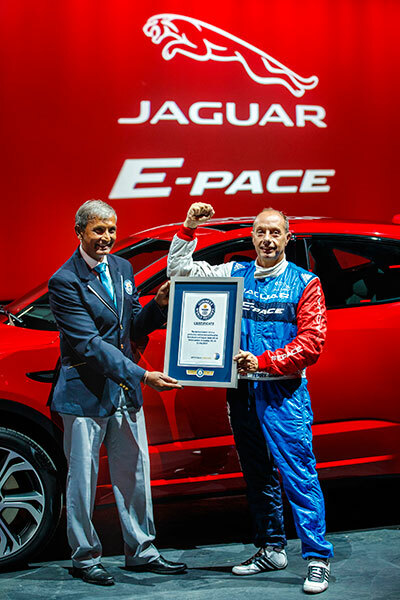 In early 2017, Terry Grant ended up pulling off this spectacular car jump on his first try and ended up in the Guinness Book of World Records with the longest barrel roll in a production car. 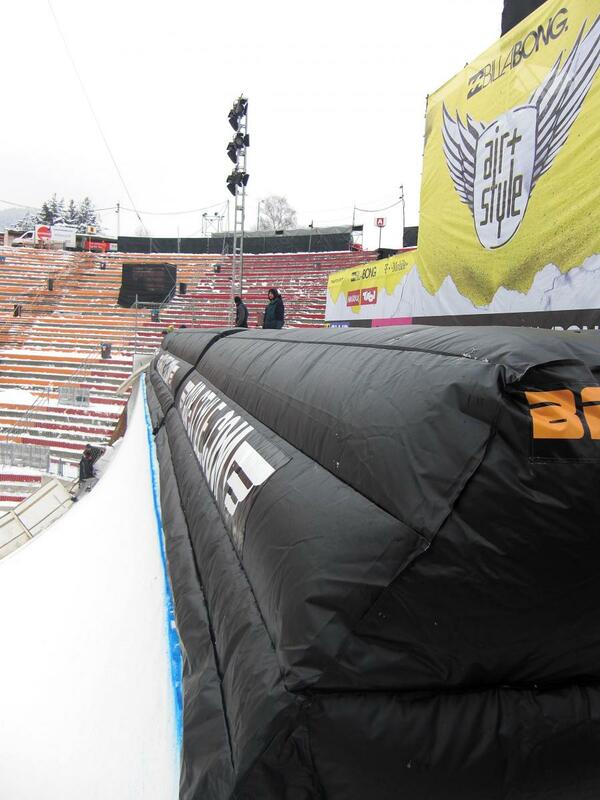 In early 2009, BAGJUMP® developed a new game-changing safety innovation for the Air+Style contest in Innsbruck – BAGJUMP® Deck Protection. 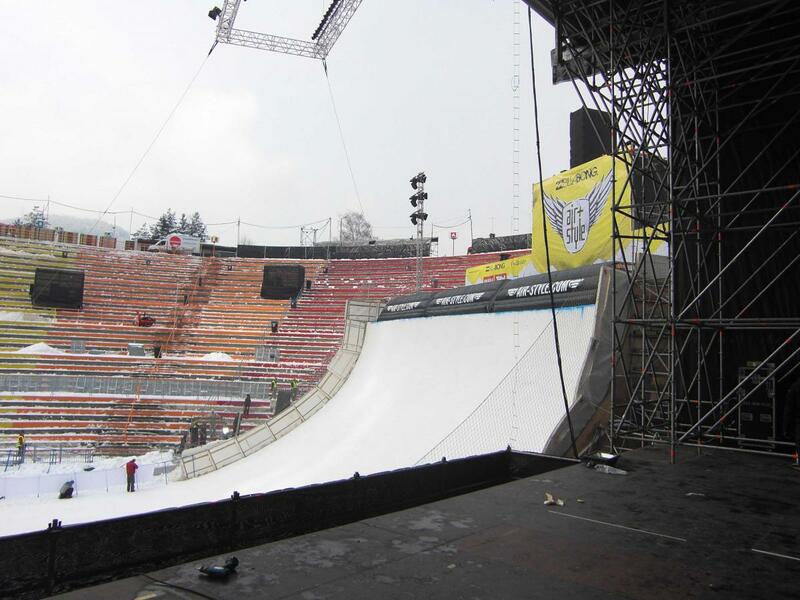 The first of its kind, this airbag system was placed on the deck of a quarterpipe or halfpipe to save athletes from deck and coping crashes during training or competitions. 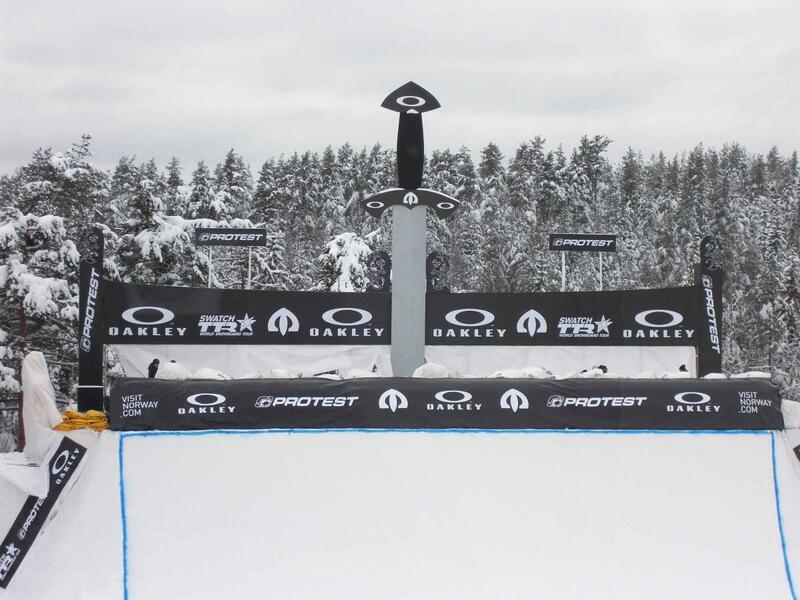 Deck Protection is used by renowned competitions such as the Air+Style QP Contests, the World Snowboard Championships and the Arctic Challenge quarterpipe contest. National teams like the Canadian Free Ski Association use this tool in their training to protect their riders from severe injury when training for the Olympics, pushing their sport to new heights. 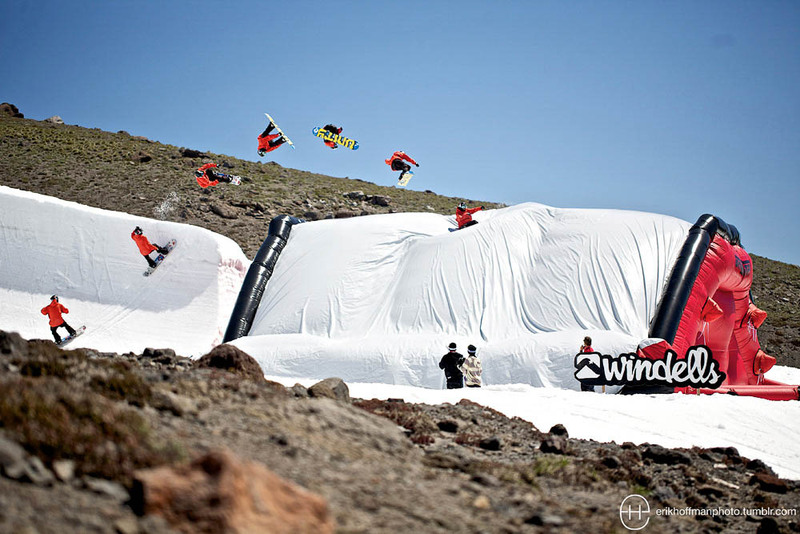 Whether you want to find out how you can benefit from an BAGJUMP® Airbag or how to transform your action sports business, you'll find the answers to your questions right here. Download this whitepaper now! 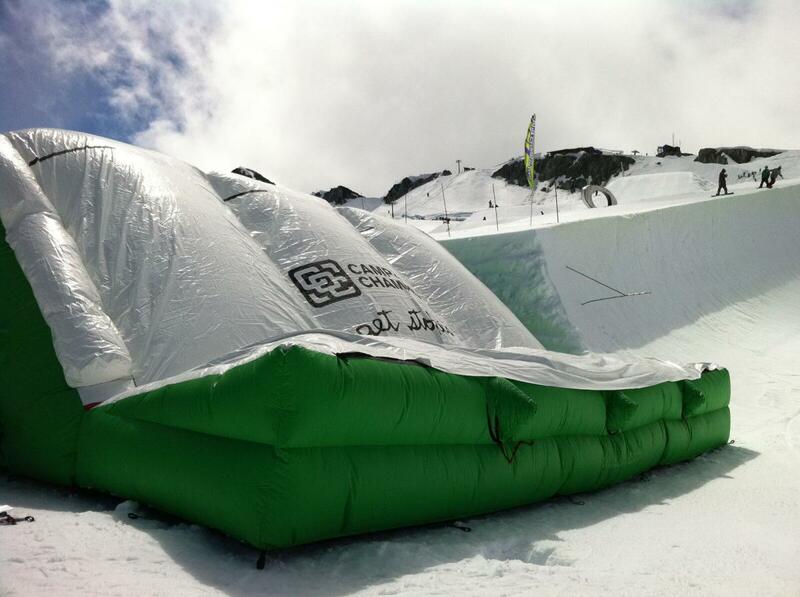 Shortly after the Halfpipe protection airbag release in early 2009, BAGJUMP® introduced the Stopper Airbag. 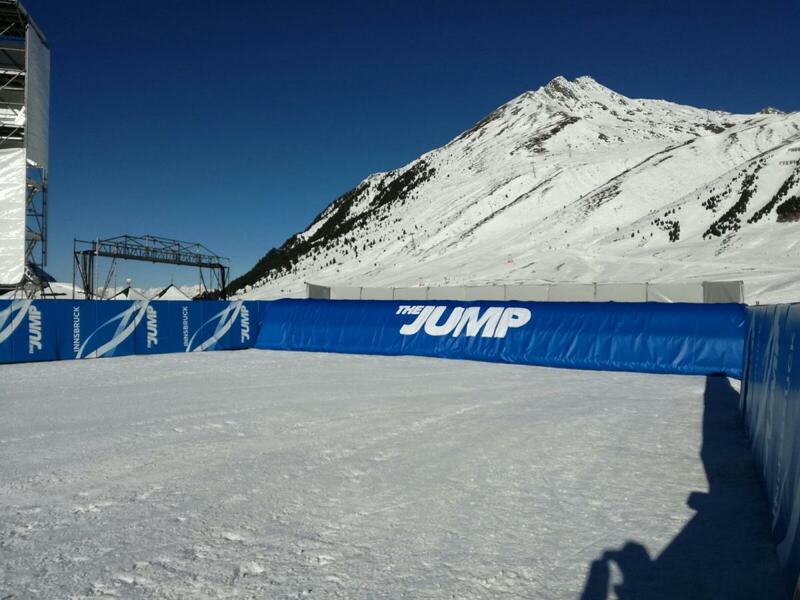 This BAGJUMP® airbag invention is capable of absorbing vertical, but also horizontal impacts for various sports. It can be placed in the outrun of a ramp to absorb the remaining speed of participants who are not able to slow down enough. 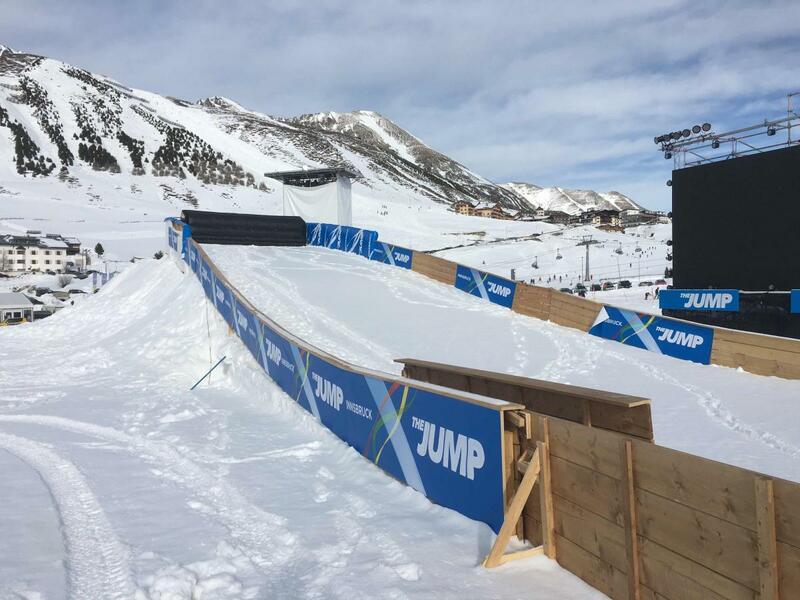 It is often used in competition setups for biking, FMX or skate as well as outruns of ski races or ski-jumping facilities when there is not enough space for riders to slow down. 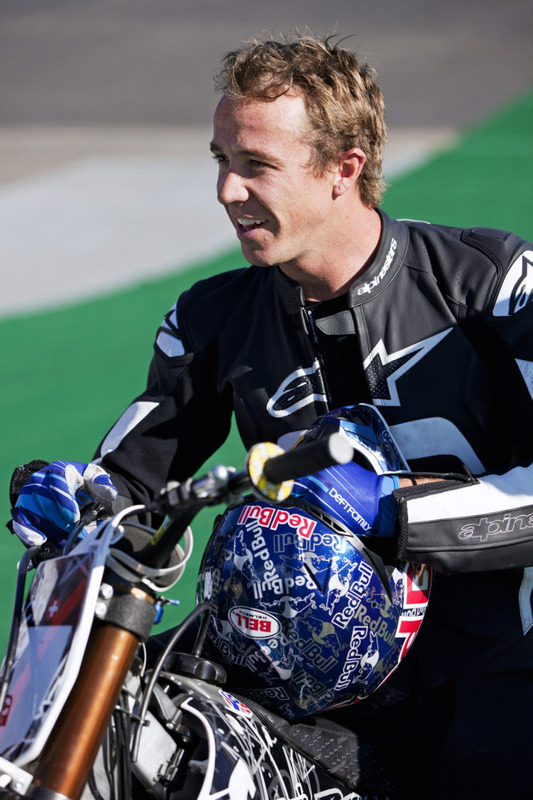 Touring shows like Nitro Circus use the Stopper Bag to slow down the riders when they land their trick to minimize the necessary outrun space. It is also a great opportunity to place sponsor logos right in the centre of attention. The impact protection can be used to cover impacts in danger areas such as out-runs, sharp turns, walls and in front of non-moveable objects to prevent from injury. 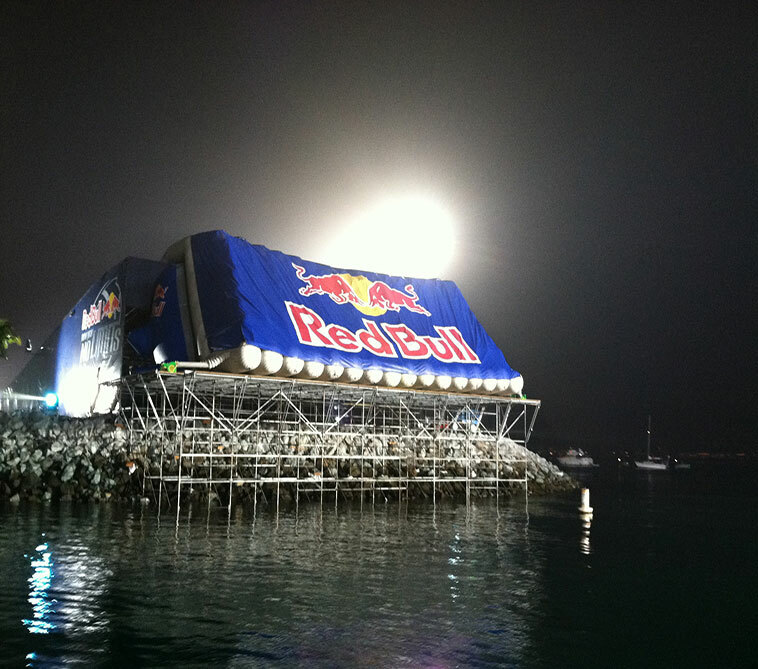 BAGJUMP® High Speed Impact Protection was developed to protect Robbie Maddison and Levi Lavallee RedBull as they jumped side by side over the Bay at San Diegos Embarcadero Park in California, USA, at the No Limits 2011 New Years Eve show. 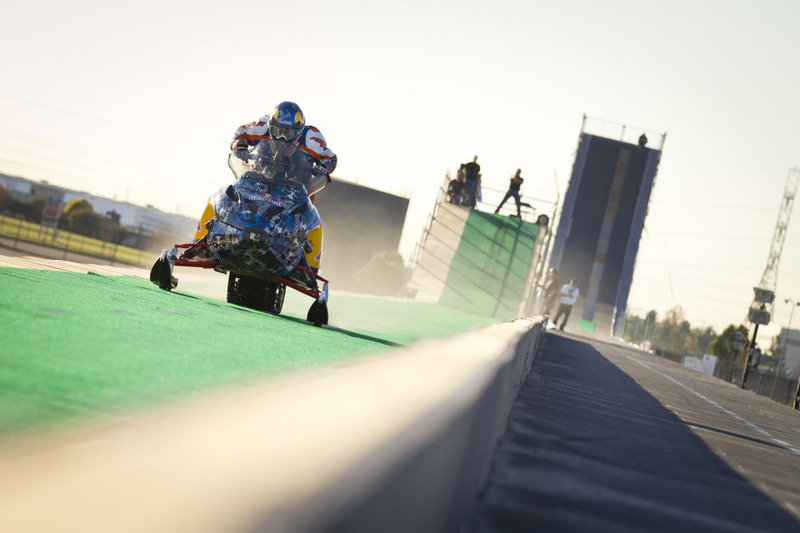 The High Speed Impact protection is placed in front of a landing to protect from high speed impacts of over 100 km/h (62 mph). 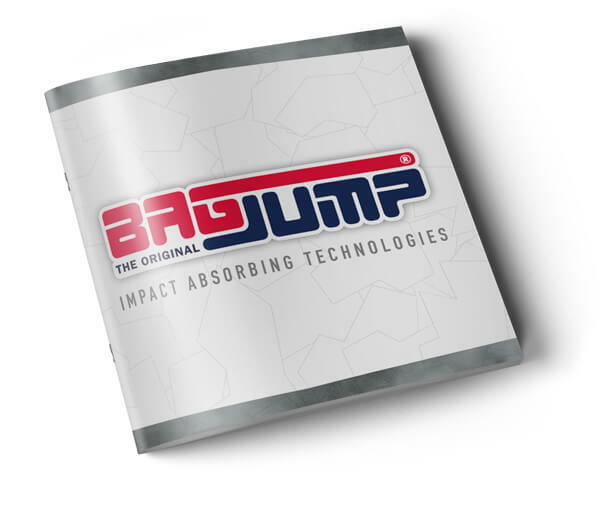 This system combines the best of BAGJUMP® by uniting the air pillar technology together with the valve technology from the large BAGJUMP® Allround airbags for maximum impact absorption. Order the High Speed Impact Protection in your custom size and color now! 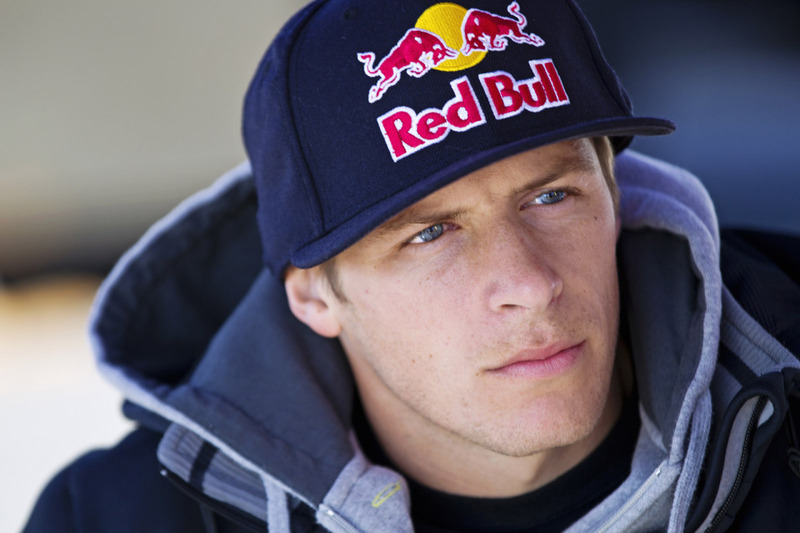 VERTBAG / RED BULL, MONSTER, ETC. The BAGJUMP® Vertbag was introduced in 2011 at Windells Summer Camps at Mt. Hood, Oregon, USA. 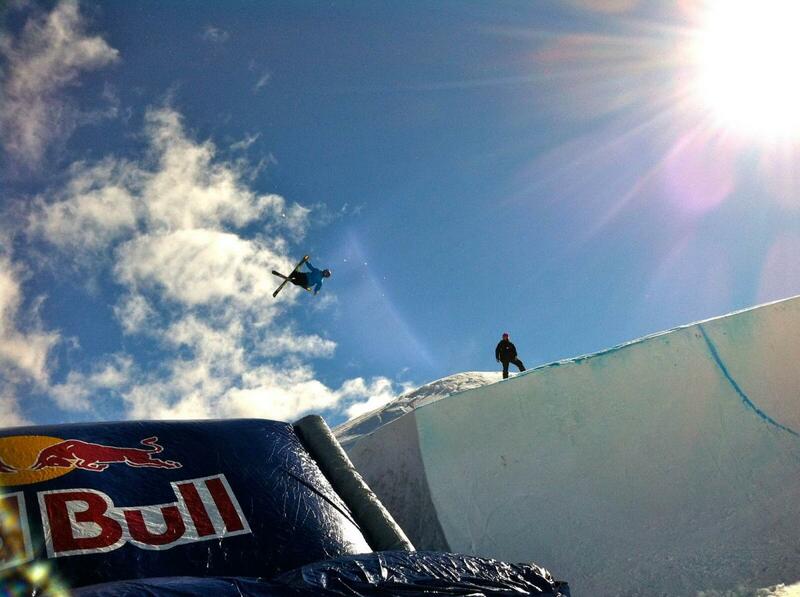 The goal was to offer Superpipe riders a realistic, yet soft and forgiving landing to practice their jumps on. 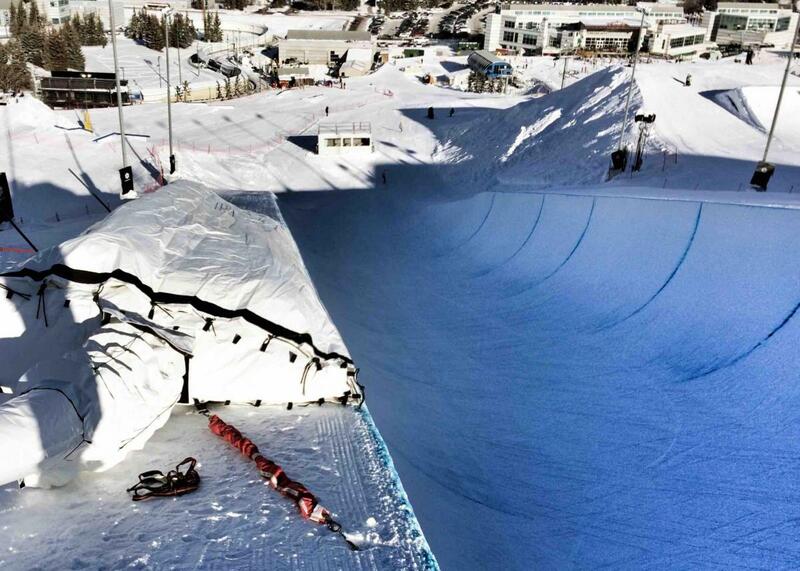 As we all know the coping and flats of a Superpipe are hard as ice, but the Vertbag is the opposite. Thanks to its slanted landing angle, it is more realistic than landing into a flat airbag, giving you an ideal training scenario for progression. 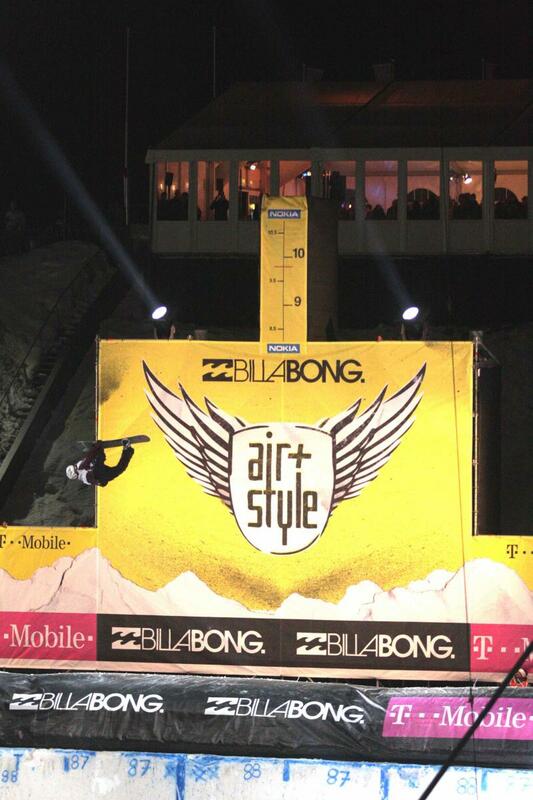 The Vertbag is simply placed as the last hit on the bottom of the Halfpipe or next to a Quarterpipe in extension of the coping. With its A-Frame shape and detachable bottom catch cushions, it can be easily moved from one wall to another - even inflated to reduce time. 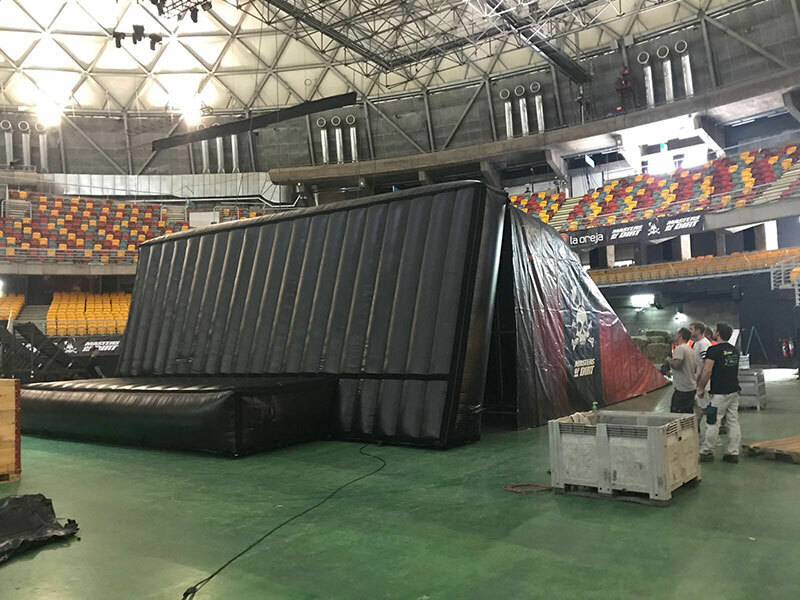 National Teams and training facilities who own a Vertbag, such as the US-National Team, Team China, Team Russia, Windells Summer Camps in Mt. 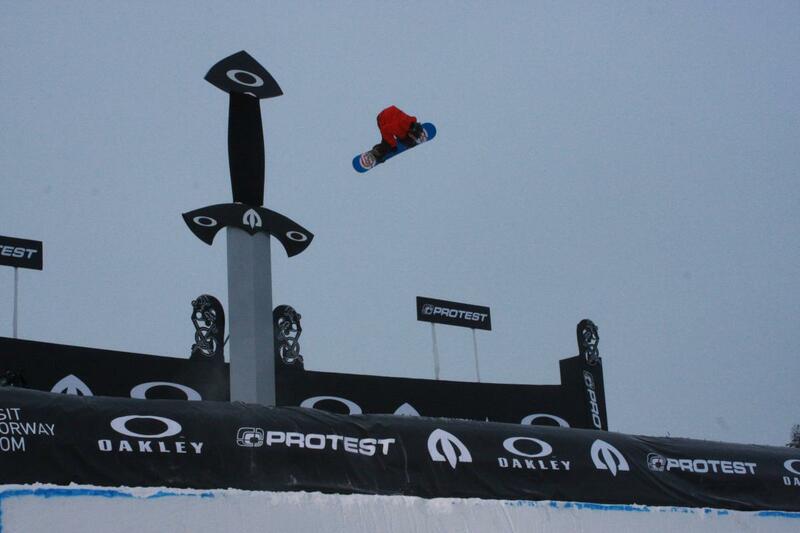 Hood Oregon and the Camp of Champions in Whistler have successfully learned new tricks that place them regularly on the podium in competitions. 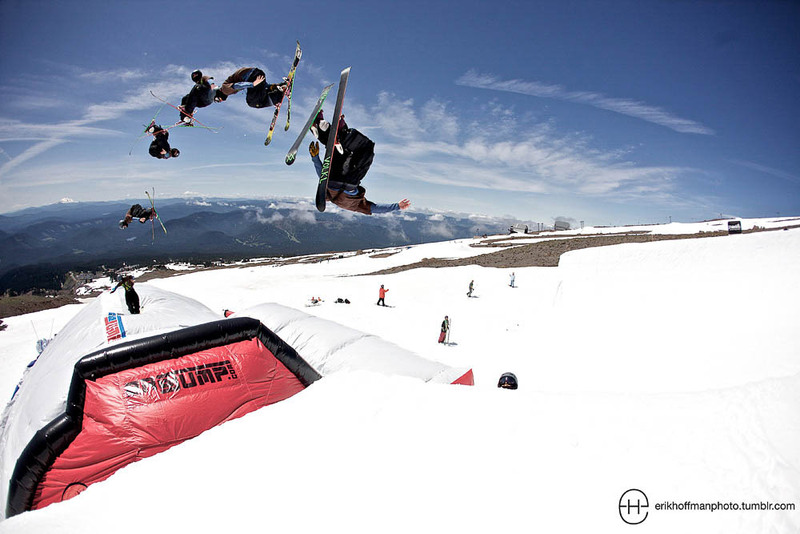 Brands such as Red Bull or Monster Energy do several airbag progression camps throughout the year with their BAGJUMP® Vertbag to take their sponsored athletes to the next level. 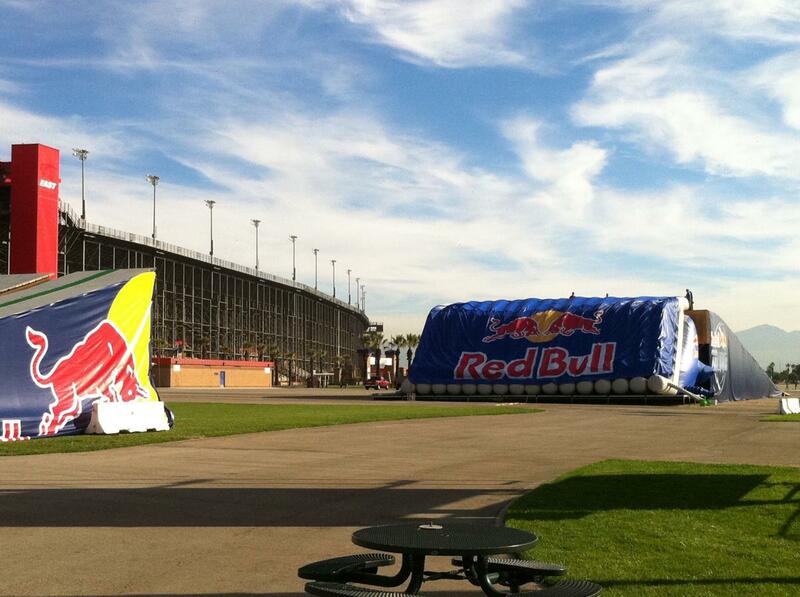 FMX LANDING PROTECTION / NITRO CIRCUS, MASTERS OF DIRT, etc. 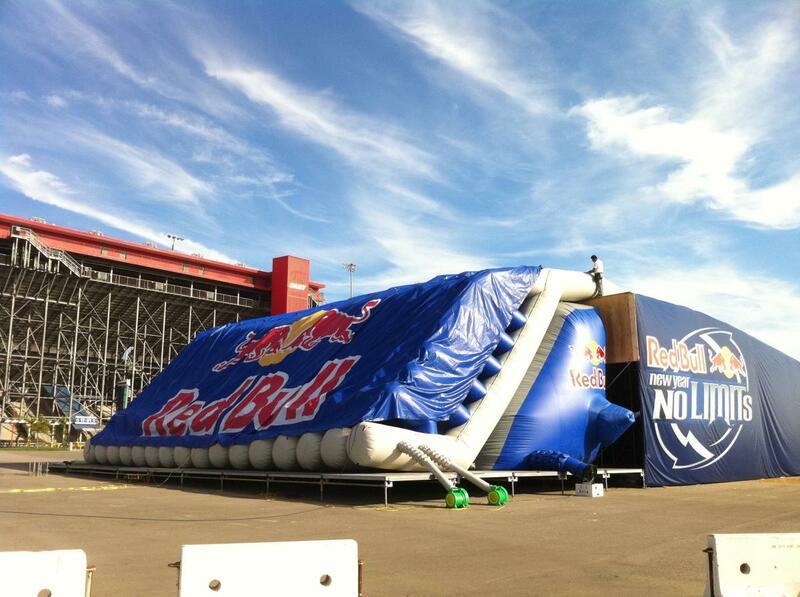 The Landing protection is placed in front of a landing to protect athletes in various ramp sports such as FMX, Bike, Skate etc. 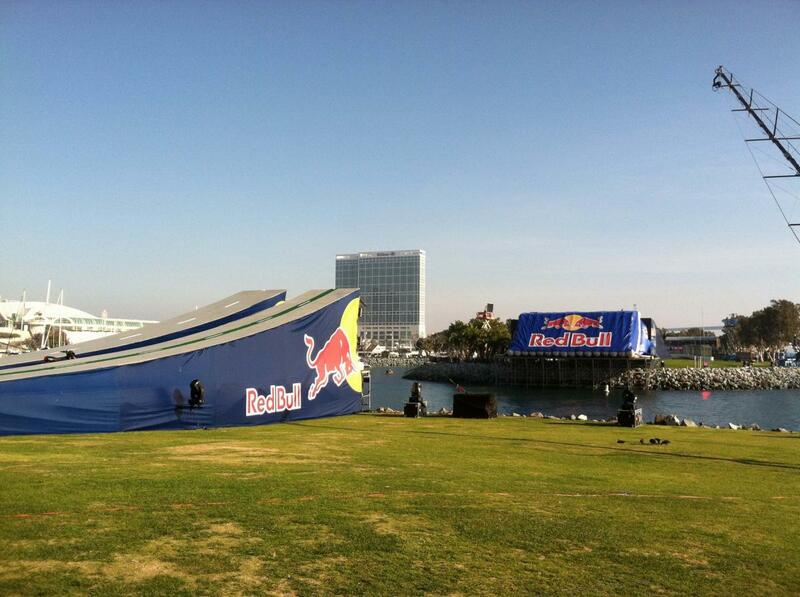 from crashing into the backside of the landing in case they come short. With its unique L-Shape design, it not only protects the crash in to the backside of the landing itself but also catches the athlete to prevent a fall to the ground. Order the Landing Protection in your custom size and color now!